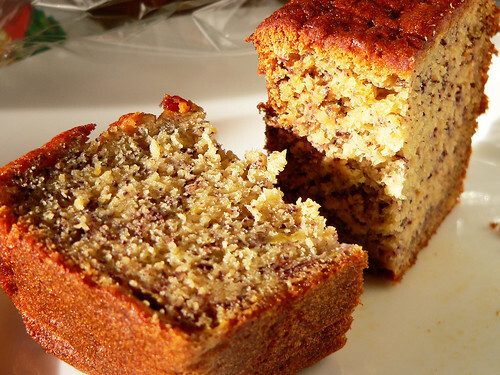 In one of my micro–blog posts I said that I’d made a really yummy banana cake, and Shai Coggins asked for the recipe. It’s worth sharing on my blog as it is absolutely deliciously moist, and did I say yum? I managed to take this photo just before I wrapped up the last two pieces. I’m not sure where the recipe originated but it’s on a piece of paper handwritten by either me or my sister. Beat butter and sugar to a cream then add beaten eggs and vanilla – beating well. Mash bananas thoroughly and add. Sift in the flour. Dissolve bicarb soda in hot milk and add last Blend all thoroughly but lightly. This makes a fairly stiff mixture but is very light and fluffy when baked. Grease a tin (I put mine in a loaf tin and I usually line it with baking paper), and pour the mixture in. Then fight with your child about who gets to lick the bowl and the beater. Bake in a moderate oven (about 180 degrees celcius) for 25-30 minutes. In my oven it takes a bit longer which could be because of the loaf tin I use but I always test with a skewer to make sure it’s cooked through. As you can see from the photo I didn’t ice it, but a cream cheese type icing goes well, or just whipped cream. I did have some cream left from something else and enjoyed a piece with cream over the top. Let me know if you use this recipe. I would love to hear what you think of it. Oh wow! That photo just clinched it for me. Yum, yum! Can’t wait to try this out. I Stumbled it too. 🙂 Thanks again for sharing this recipe, Jen! Shai, Yes, the photo turned out well. Thanks for the Stumble. Enjoy! Looks fantastic. I am not a fan of bananas, but buy them for V and ‘Salina – who invariably allow the last 2 or 3 to get to the stage where I muffinicate them – I may try this next time round! That banana cake looks so good Jen. I could go for a piece of it right now. Hope you and JJ are good sweetie…..
Joy, the banana cake tastes as good as it looks. JJ and I are pretty good thanks. We’ve had a great week. Finally got around to testing this… Didn’t read it properly so the bicarb got sifted; used a round tin (child’s perogative) and have a fan-forced oven so wasn’t cooked in the middle while the outside was dry after 35 minutes (says more about my oven than the recipe) so shoved it into the microwave for another 3 minutes. It doesn’t look so pretty but smells great and is cooling at the moment. Jeanie, so you didn’t dissolve the bicarb in the milk? I think that’s supposed to help with the moistness or something. I’m sure it will taste great. I can smell it from here.